Angels are expert healers and are more than willing to assist us with our challenges and complaints—all we need to do is ask them for their help! When we reach out to a higher power for spiritual assistance, it is the angels who are sent to bless us, protect us, guide us, heal us, and light our way. The Power of Angel Medicine introduces you to many of these magnificent beings, so that you can learn about the divine powers and special attributes that can help you heal. Discover insightful information about your divine design—your soul and spirit. 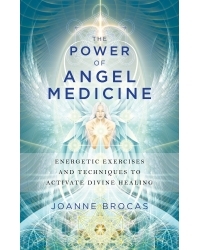 Boost your vitality with angel medicine exercises for common complaints. Activate divine healing power with angel-medicine prayer frequencies. Work with angelic experts for persistent health issues. Receive divine knowledge from the angel alchemists to help cocreate your dreams.